NJAA is proud to announce it has earned three awards for its excellence in digital communications and editorial content. The Academy of Interactive and Visual Arts (AIVA) honored NJAA with a Communicator Award of Distinction for the editorial content and intuitive use of its website. In this category, NJAA stands among winners including Johns Hopkins University, Smithsonian Museums, and Mercedes-Benz. With over 6,000 entries received across the U.S. and around the world, AIVA’s Communicator Awards contest is the largest and most competitive awards program honoring creative excellence in communications in the nation. NJAA also received two 2018 Awards of Excellence from the Apex Awards for Publication Excellence contest. NJAA’s new website, which was launched in 2017, earned top honors in the Most Improved Website category and NJAA’s March/April 2017 Apartment Industry Magazine received an award for its content and design. 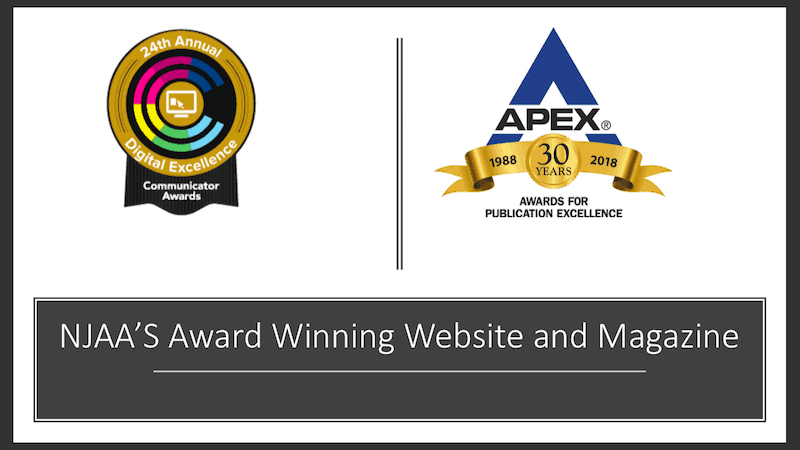 The Apex Awards contest is an international competition recognizing outstanding publications including newsletters, magazines, websites, reports and marketing materials. Of the over 1,400 entries received this year, only 556 received an Award of Excellence. Thanks to our members, leadership and staff for making our communications and marketing a success!